Don't know exactly what they'd like? 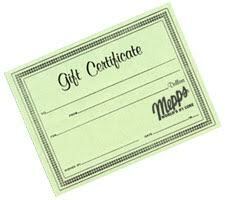 All anglers would appreciate a Mepps Gift Certificate. It's the perfect gift for Father's Day, Mother's Day, Birthdays, Christmas and more! We e-mail your gift certificate to the recipient, so it can immediately be used towards their next purchase online at Mepps.com. Need to redeem your gift certificate? You can redeem your gift certificate in your My Account area or while you checkout during your next Mepps order.